In Sisters it can freeze any night of the year. It was 19 degrees at our house this morning (May 10). Even the tougher kale, spinach, onions, etc. will wilt under that chilling temperature. There are lots of greenhouse designs out there and wading through them can be intimidating to say the least. And prices are all over the map. You can save a lot of money, though, if you do most of the work yourself. That could be as easy as pipe hoops and 6-mil plastic or a full-scale permanent structure. Another way to cut down on expenses is to buy a used greenhouse and reassemble it on your property.  How are you going to keep it cool? In my greenhouse, we put in adjustable louvres in the peak, windows that open all along the knee wall, and a fan at the end and STILL my plants were all sweating and dying of heat exhaustion. So now I'll be putting in a much bigger fan to carry off the excess heat.  How are you going to keep it hot? At night the temperatures drop dramatically, and if they fall under, say, 60 degrees, your tomatoes will barely grow; they need steady warmth, night and day, to do well. Space heaters can be expensive to operate, so if that's not in your budget, then you'll have to think of a way to keep the day heat from vanishing in the night. Some people pull down curtains over their windows, others fill water containers that heat up during the day and radiate it back out at night. Some install radiant floor heating during construction - the water in the underground pipes can be heated through a solar collector or wood burner. I bumped into a guy who had a whole stack of glass windows removed from storm doors who was willing to sell them to me for $5 each for my new greenhouse. Without thinking, I said "Sure!" happy with my bargain. Not only were they very hard to install but at night, the heat from the day goes right out through the glass without stopping to say "goodnight!" A much better material is Solex - more expensive but tremendously better at insulating. One more thing regarding heat loss: You can build a solid insulated wall on your north side. Not much sun comes through there anyway, so why have that open to more heat loss?  Are you going to grow in the ground or in raised beds? You can do either but I would recommend using eight-inch-high grow-boxes made of cedar planks. They're much neater, easier to tend, and allow you to drag hoses around without pushing over plants. Grow-boxes tend to stay warmer as well. If you fill them with a soil-less medium such as sawdust and sand, you won't have to worry about weeding. I personally recommend using the Mittleider method of gardening for maximum yield, plant health, and superior flavor (see the Nugget, May 9, page 14 ).  What are you going to plant? Use your greenhouse for cold-sensitive plants and don't waste space putting in lettuce, spinach, cole varieties, root crops etc that will do fine outside. I grew tomatoes, peppers, eggplant, basil and other warmth-loving varieties. I've barely touched on the whole subject, but if you would like to serve your family or friends some amazing bruschetta al pomodoro with fresh tomatoes from your indoor garden in November (! ), you need to start on that greenhouse now. 1. "Building Your Own Greenhouse" by Mark Freeman, Stackpole Books. Very straightforward advice on greenhouse design and construction, especially for cold climates. 2. "Greenhouse Gardener's Companion" by Shane Smith. Not only design and construction ideas but also how to grow successfully in a greenhouse environment. 3. "The Winter Harvest Handbook" by Eliot Coleman. 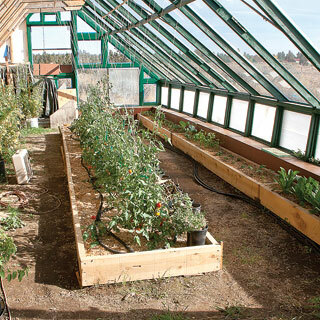 Yes, you can grow vegetables all year 'round, even in an unheated greenhouse. This guy explains how (and he lives in Maine! ).